We jointly discuss The Beast Must Die(1974). For once Tim has picked an actual good, bad movie. Calvin Lockhart plays a rich man who wants to hunt the most dangerous game. The twist is, that’s not people but rather the werewolf. He has gathered a guest list of people who could very well be werewolves(say that three times fast.) 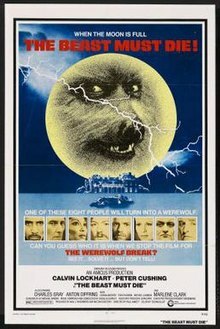 During the course of the film he has to find out who is the werewolf and will he be able to kill it? Tim reviews a movie which had an internet micro-versy about it back when it was announced, No Escape. Owen Wilson plays an engineer who goes to some unnamed, for real life political reasons, country in the middle of a revolution. He then has to try and keep his family safe and escape. Something that wouldn’t be possible if he didn’t get help from the criminally underused Pierce Brosnan who dies heroically to save them later.